I was sent a book to look at a while back. I finally had a chance to tell you about it! This is a delightful gift book - pretty and inspirational. 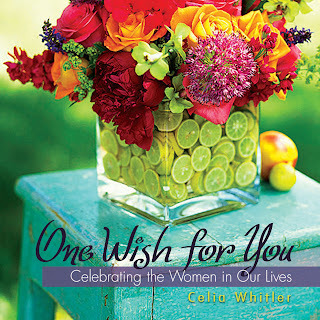 It's called One Wish by Celia Whitler. It celebrates the women in our lives. It would make a lovely gift for your mother, your daughter, your friend, your teacher or your co-worker. There are beautiful pictures throughout the book with lovely thoughts and Scripture references to brighten your day. The colors and pictures are soft and soothing. It's a bit like bringing in some Spring flowers to freshen your house. There is a bonus CD included with 5 songs by Celia. One Wish For You is the first song. All the songs are nice, but my favorite is We Believe. If you'd like more information about the book, you can check out the site here. You can even purchase the book right there (and it happens to be on sale right now!). Do you already have this book? Are you inspired by some special women in your life? That sounds really good my friend. I'm off to make pancakes before church. Have a most excellent Sunday. Big I'm too hungry to think of anything clever this morning size hugs to you!